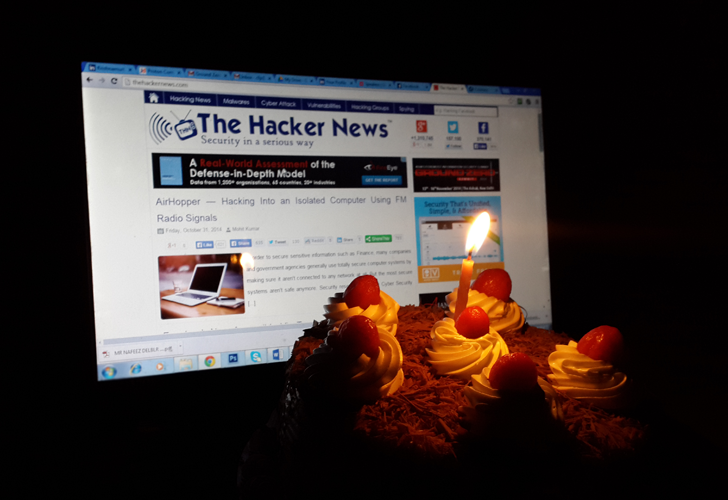 'The Hacker News' is celebrating its 4th Anniversary today and we would like to thank every single Hacker, Researcher, Journalist, Enthusiast who has contributed to our phenomenal growth. When we began our journey 4 years back as a Small Local Community of few Hackers and Security Researchers, we had a dream of providing the Hacking Community with World's not first but best Hacking and IT Security News Platform. We wanted to gift hacking community members and security researchers their own trusted and an unique News platform, which is run by Hackers and dedicated to Hackers, a platform which is free from Censorship, Conventions, Governments and Borders. Now, we have been Internationally recognized as a leading news source dedicated to promoting awareness for cyber security experts and hackers. We are happy to announce that this project is now Supported and endorsed by thousands of Security Experts, administrators and members of various underground hacking groups and communities worldwide. In the last 4 years we have grown into a huge family of more than 1.3 Million Google+ Followers, almost 400K Facebook Fans, and 161K Twitter Followers, with more than three million monthly readers and the family keeps on growing with new members everyday. We will continuously work closely with and within the Cyber security and hacking communities in an effort to make the Internet more Secure place for users. We all are obliged to take Security in a Serious way. We promise to serve you with our best. Make sure that you never miss our latest THN Stories, so Subscribe for free updates right straight from our website to your Email Inbox. Also Follow us on Twitter, Facebook and Google+. Thank you all for your support.